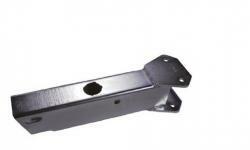 H/T HOUSING, RELIABLE TO UFP CONVERSION, 5"
OUTER MEMBER, H/T, 5", REL. TO UFP CONV. *****THIS IS FOR A 5" FRAME HEIGHT ON 4" CENTER HINGED TONGUE OUTER MEMBER ACTUATOR HOUSING USED TO CONVERT YOUR OLD "RELIABLE" BRAND BRAKE SYSTEM (PARTS ARE NO LONGER AVAILABLE FOR RELIABLE) OVER TO THE UFP A-60/A-75 ACTUATOR. THIS IS FOR THE HOUSING ONLY AND WILL REQUIRE REUSING YOUR EXISTING BOLT AND HITCH PIN, AND BUYING A NEW UFP INNER MEMBER (ACTUATOR) AND OUTER MEMBER BRAKE CAP (65-1025 OR 65-2060).